First, I wanted to do a show that anybody could stumble upon and with absolutely no prior experience in genealogy be able to listen to and enjoy and that would walk them step by step through the process of doing family history research. It's like a long term free seminar that you can listen to and work along with! The other area I've wanted to focus on is success stories and words of wisdom from experienced genealogists. As I travel around going to conferences and as I read my email, I hear so many great stories. I wanted to have a show where I could really showcase these stories and the wisdom of experienced genealogists. 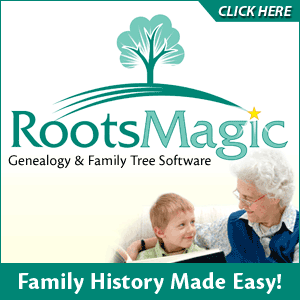 Newbies to genealogy will get a sense of what they can look forward to, and more experienced genealogists like you guys can enjoy hearing personal stories from those that you have probably heard of in the world of genealogy. So that's what you'll find at Family History: Genealogy Made Easy - Personal conversations and stories from the experts, and a genealogy how to course all wrapped in to one. Flash video issue has been resolved. The James Ritty Patent at Google Patents. Ben Sayer reviews genealogy software for the Macintosh computer: MacFamily Tree. Lee wrote me to say "Seeing your own love of quilts, you know how precious these handmade creations will be to our descendants throughout the generations. 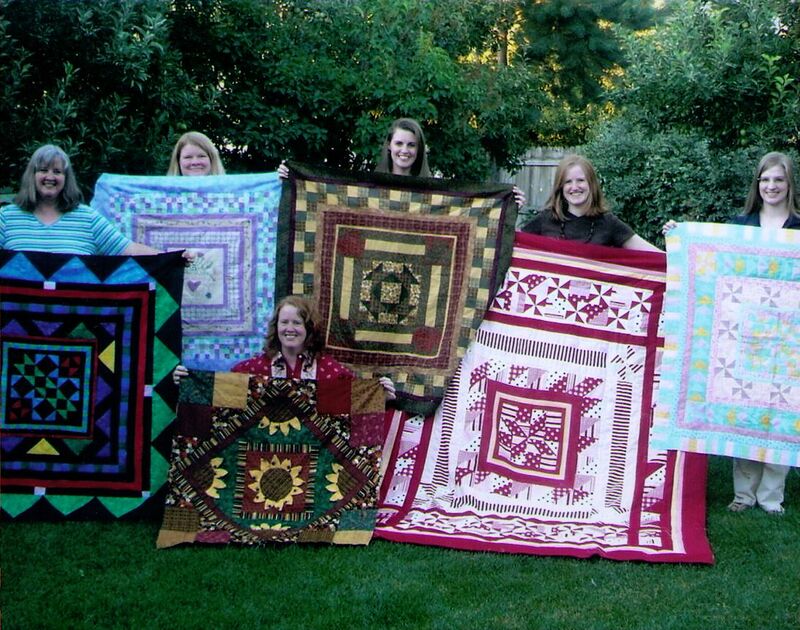 And so it goes, passing on skills, love and enjoyment across the generations through the use of sewing needles..."
Sister Quilts - Round up relatives from the neighborhood or around the country and start a tradition that will create lasting heirlooms. 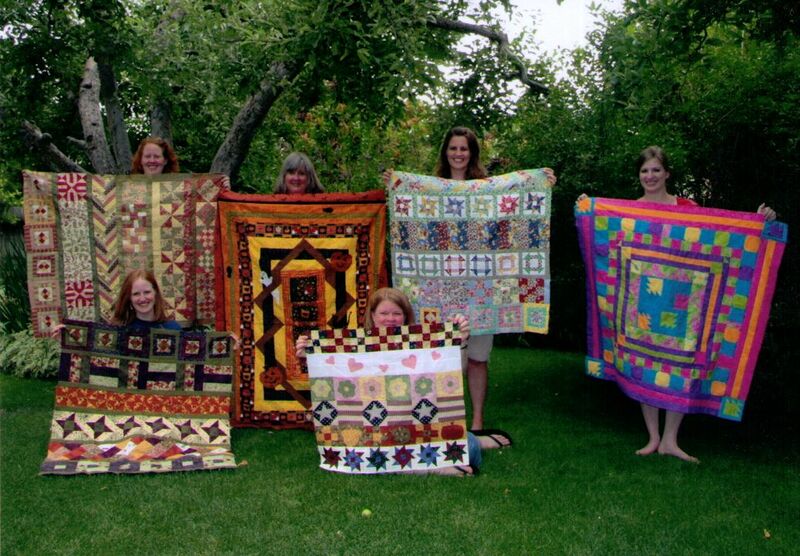 If you don't have a lot of quilters in your family, how about doing cross stitch or scrapbook pages. Create a family tree wall hanging. There are so many mediums you could use. Quilting, applique, cross stitch, painting, the options are pretty limitless. I love how Connie incorporated family silhouettes into the tree. Create unique heirloom clothing. Not artistic or handy with a needle? How about creating custom shirts on a website like Cafe Press. Just upload your images and add text if you like. How about a shirt for each person with the photo of the ancestor they remind you of most? And you could still sew in a little tag that says it was created with love from grandma like Connie did. Whether you're really artsy or don't have a creative bone in your body, there's a project out there for you that will allow you to express yourself, and promote lasting family traditions. 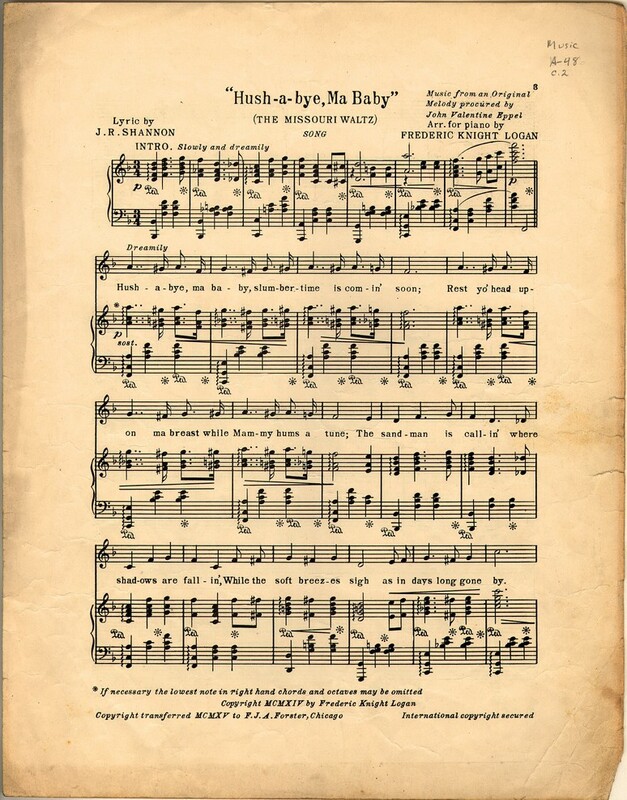 The Library of Congress American Memory Website had the old original sheet music. The song is entitled Hush-a-bye, Ma Baby with a subtitle of the Missouri Waltz. Lyric by J. R. Shannon. music from an original melody procured by John Valentine Eppel, and arranged by Frederic Knight Logan. Thanks to those who wrote and called in for identifying the song for me!In this episode I play another song in the hopes that you'll be able to do it again. Mystery Song #2 - NAME THAT TUNE! If you think you know the name of that song, please email me or better yet call and leave the answer on the voice mail line at 925-272-4021.